If you’re looking for creative February social media ideas then you’ve found it. This post is packed with Social Media Holidays for February, with plenty of social video ideas, GIFs and more! You’ll find popular and international holidays as well as crazy and unusual days of celebration. And there’s more than 30+… there’s literally dozens! There’s social media holidays for each day of the week. And we also have a list of tools and ideas you can return to at any time for later reference! What Comes With The February Social Media Ideas? a quick reference guide to social media holidays for each month. We’ve added them to a handy infographic! an overview of February social media ideas. This includes what you can create and how to share them. We focus on ideas for social video but you can use them for any type of static images too! a list of tools and resources to help you create visuals for Social Media Holidays. 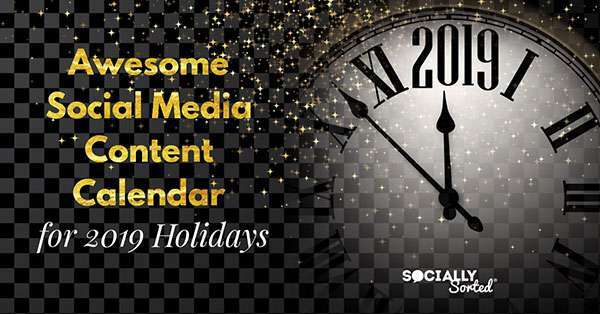 Use our Social Media Content Calendar to help you! Creating content can be hard and takes time, but if you schedule ahead and do a few simple things, it makes it much much easier for you. Create short video for social media – it doesn’t have to be an hour long. 15-30 seconds is enough. For more advice about how to create effective 15 second videos, check out this post. Create some easily consumed content. For example, quotes, tips or observational humour are great for engagement, especially on Facebook where people are just scrolling through content at a rapid pace. Use GIFs to add some personality. Whether you create your own GIFs (I’ve added tips below) or you use one of the millions of GIFs in the Giphy library, adding a GIF to a social media post, email or blog post can add humour and personality to the mix. Create a social video based around the holiday in question – do a Top 5 list, a how-to video, behind the scenes of your business (related to that holiday), a tutorial, or a quote video. Get creative! Is it Pizza Day? Do a video about Pizza Fun Facts! Use a video tool like Wave to help you. This post focuses on social video, GIFs and animations but you can use all of this information to create still images too. You are only limited by your imagination! I’ve included more tools and tips below for creating February content. Let’s dive in! I’ve included at least one holiday “day” for every day in February list of social media ideas and holidays. I’ve also included hashtags, tools, tips and resources for creating visual content in 2019. This post will be updated annually to check dates. We’ll also add content as we create or discover it. So keep it bookmarked to refer back to! 1. Wear Red Day (US) – for heart disease awareness. #WearRedDay. 2. Groundhog Day – #GroundhogDay. Today is a good day to share a movie clip from the movie Groundhog Day, a quote or maybe a Fun Fact about what Groundhog day actually is! GIF by Socially Sorted (check out more on my Giphy Brand Channel here, and feel free to share!). What list of February Social Media Ideas would be complete without Valentine’s Day, right? Create a video like this one! To make this video I searched on video templates in Wave.video to find a Valentine’s Day themed template to create the video. Share it on Facebook or create one yourself in Wave. Not sure what a Tim Tam is? Check out this video that my friends at J29 Creative made after I sent them a gift of some Aussie treats! 17. Random Acts of Kindness Day #KindnessDay. Find out more at this website. Whatever your language skills, take the time to highlight other languages and mother languages today. It’s a day to ask your audience to share what their 1st language is or maybe thank them in another language! It looks like Hallmark Cards has branched out and now makes GIFs for us to share! Want to use this template? Find out more about this template and Retro Day here on Wave’s Monthly Content Calendar. 28. National Chili Day – find out more here. Note: Chilli is spelled as “Chilli” in British English. Here’s a quick and easy tools list for you to find Video content ideas to create videos or GIFs quickly and easily for your social media channels. And they have a massive audio library with easy editing tools too. I could go on and on. Check out the review I wrote here. Here’s a video walkthrough of Wave. Giphy is the best source online for finding GIFs to share from their GIF library. Simply go to their website and search on the hashtags that you want to find GIFs for. Get creative with your hashtag combinations and you’ll find all sorts of gems! I also have a branded Giphy Channel and will be sharing my GIFs in these monthly posts so you’ll find some fun ones in there to share too. Do you schedule your content ahead? What are your Favourite February Social Media holidays and have we missed any? The post 60+ February Social Media Ideas – Video Ideas, GIFs and more! appeared first on Socially Sorted. Is There Magic Behind Your Bulk Uploading Scheduler?